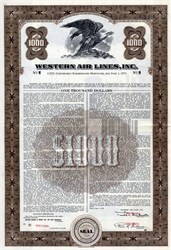 Beautiful specimen certificate from the Western Air Lines, Inc. 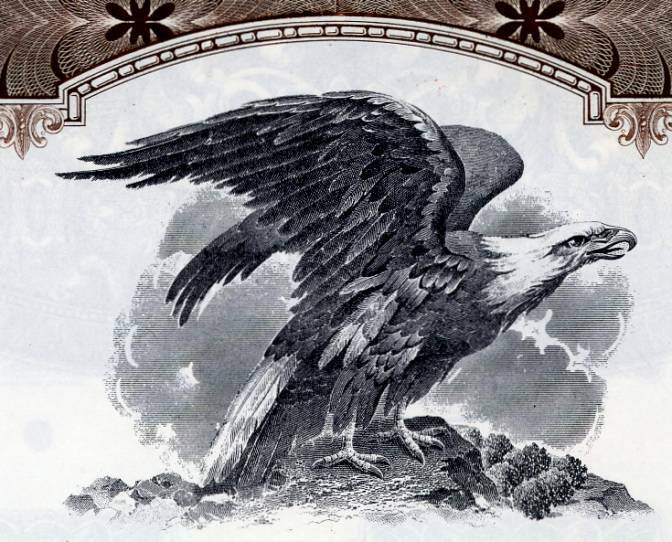 This historic document was printed by the Jeffries Banknote Company and has an ornate border around it with a vignette of an eagle. This item has the printed signatures of the Company’s President, and Secretary, and is over 57 years old. Western Airlines (IATA: WA, ICAO: WAL, and Callsign: Western) was a large airline based in California, with operations throughout the Western United States, and hubs at Los Angeles International Airport and Salt Lake City International Airport. In 1925, the United States Postal Service began to give airlines contracts to carry air mail all around the country. The company first incorporated in 1925 as Western Air Express by Harris Hanshue. It applied for, and was awarded, the 650-mile long Contract Air Mail Route #4 (CAM-4) from Salt Lake City, Utah to Los Angeles. In April of 1926, Western's first flight took place with a Douglas M-2 airplane. It began offering passenger services a month later. The company reincorporated in 1928 as Western Air Express Corp. Then, in 1930, purchased Standard Airlines, subsidiary of Aero Corp. of Ca. founded in 1926 by Paul E. Richter, Jack Frye and Walter Hamilton. WAE with Fokker aircraft merged with Transcontinental Air Transport to form TWA. Western Air Transport soon broke off from TWA's structure, and in 1934, changed its name to General Airlines. In 1941 General changed its name back to Western Airlines. After World War II, Western expanded into a large regional airline, introducing service on the Lockheed Constellation, Douglas DC-6, and Lockheed Electra. It merged in 1967 with Pacific Northern Airlines and in the late 60s pushed for an all-jet fleet, adding Boeing 707s, 727s and 737s to its fleet of Boeing 720s. In 1973 it added McDonnell Douglas DC-10s. Western Airlines was headquartered in Los Angeles, California. Its major hubs were at LAX and Salt Lake City, Utah and smaller hubs in Las Vegas, Nevada and Denver, Colorado. On October 31, 1979, Western Airlines Flight 2605 crashed while landing at Benito Juarez International Airport in Mexico City. The crew of the DC-10 had landed on the wrong runway and impacted with construction vehicles. At its peak in the 1970s and 1980s, Western Airlines flew to many cities across the American Southwest and to various spots in Mexico, Alaska, Hawaii and Canada, while keeping a large intra-state route structure in its home state of California. It began flights from Anchorage and Denver to London Gatwick Airport in 1981. As it extended its eastern network to such airports as Washington-Dulles and Boston-Logan, it became a prominent sponsor of the Bob Barker television show The Price is Right, to try to make customers from the East more aware of its presence. In the early 1980s, Air Florida tried to buy Western Airlines, but it was able to purchase only 16 percent of the airline's stock. Finally, on September 9, 1986 Western Airlines was bought by Delta Air Lines, and it merged fully into that airline on April 1, 1987. After the merge, Delta eventually released the name Western Airlines. Western can also be noted for contributing to popular culture with its 1960s advertising slogan, "It's the oooooonly way to fly!" Spoken by the Wally Bird, an animated bird hitching a ride aboard the fuselage of a Western airliner, and voiced by veteran actor Jim Backus, the phrase soon found its way into animated cartoons by Warner Bros. and Hanna-Barbera. Another famous advertising campaign by the airline centered on Star Trek icons William Shatner and Leonard Nimoy. During the 1970's, they promoted themselves as "the champagne airline" because champagne was offered free of charge to every adult passenger over 21 years old.